Some 70+ years after being published, as far as we know it is still impossible to find a journalist that hasn’t read and enjoyed Scoop. A few in our group were a bit sceptical. They compared it to a book of Giles cartoons. One cartoon is a joy: hilarious, shrewd and complex; an entire book is too much. As the discussion progressed, however, some of the critics considered giving Scoop another chance. Lush places aside, Waugh’s crystalline prose could be poetic at times. We all appreciated some beautifully descriptive passages, but, on the whole, humanity does not fare well. No puffed-up ego, callous opportunist, petty fascist or casually corrupt official can escape and some found the cynicism relentless. But many thought that, looking through the eyes of innocent and earnest Boot, and perhaps, too, with the young luckless Kätchen, Waugh managed to avoid misanthropy. 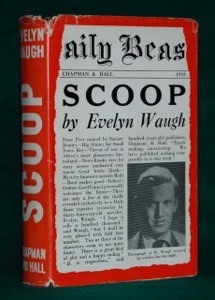 For those with an interest in literary connections, the Times Literary Supplement blog finds intriguing links between Scoop, a real-life countryside columnist, Heart of Darkness (our July 2011 read) and Virginia Woolf. Our next selection is To Kill A Mockingbird by Harper Lee.